This post comes to you because I’m getting a lot of questions about aquaponics and affordability. This post is about powering your aquaponics cheaply. Solar aquaponics on a budget is achievable. Here’s what I’ve done. I don’t know what I’m doing. What I’m doing works right now. For all I know I might be damaging my equipment. Electricity is dangerous. It’s your responsibility to understand the risks of dealing with electricity. Let’s not weld any tools to your batteries or zap your aquaponics. Batteries are dangerous too. They contain acid and they can explode. Once again, I’m not responsible for what you do. I don’t think you want acid on your or your aquaponics. I am running three grow beds right now. The solar configuration is more than adequate to handle three beds and more. I can’t imagine a typical home system that would require more, as long as the right pumps, etc. are used. You may have to scale if you’re using a lot of equipment. My aquaponics design is centered around a single 12 volt pump. Three or four really dark, stormy days in a row may take this system down. You should plan for outages. It’s important that your aquaponics not be down for long. You may lose fish or even plants. I’ll describe outage prevention for aquaponics in a later post. I spent about $500 for what I’m going to call my power plant. This includes solar panels, solar controller, batteries, wires, cables and connectors. You can spend a little less if you’re careful. You don’t have to purchase all at once. Solar Panel: I’ve tried 45 watts, 60 watts and now 120 watts. I’m running two 60 watt panels. Why two panels? Redundancy is a good thing. One might break. Check your price points. You might be able to get 100 watt panels as cheaply. As I said before, you don’t have to buy both at once. You do want to stick with the same brand and model though. You may find that the model you bought previously is out of stock, so buy as much as you can at once. 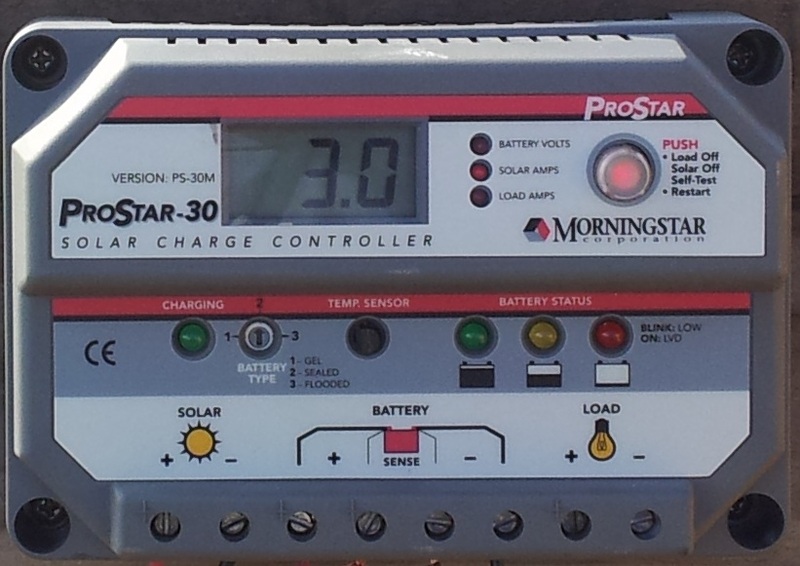 Solar Controller: This is something you don’t have to have. It protects your batteries from over charging. I paid $100 for mine but you can find them for much cheaper. Either way, it’s cheap insurance. I wouldn’t be without it. You might want to pony up more money if you want a controller that can handle different voltages, different sources (wind, hydro) or tie to the grid (so your electric company can pay you). My controller can handle different voltages and handle juice from a turbine but it can’t tie to the grid. I like the LCD readout–it saves a lot of guesswork. 3 amps at 8:30am on a cloudy day. Not bad! Batteries: Go cheap if you’re new to solar. I’m using two marine batteries. Ask for group 31 batteries. They’re usually a little over $100. I recommend going to an Interstate battery dealer and asking for “group 31 blem”, which are blemished or seconds. Other places may have them, but Interstate has taken care of me. I set my batteries up together, in parallel. This means I get juice for almost twice the time that one battery can provide. Be very careful putting your batteries together. Here’s a helpful link. It’s okay to buy your batteries a month or two apart. Just don’t buy a battery and start using it if you plan on tying it to another battery. It’s likely that the batteries won’t work to their optimum and may have a shorter life. My dream is to have edison batteries. They take a long time to charge and don’t hold a charge well, but they last a lot longer than typical deep cycle batteries. Edison batteries use nickle-iron instead of lead, and that’s a good thing to me. You may have noticed that I didn’t mention anything about an inverter. I don’t use AC power. I’ll talk about how and why later. 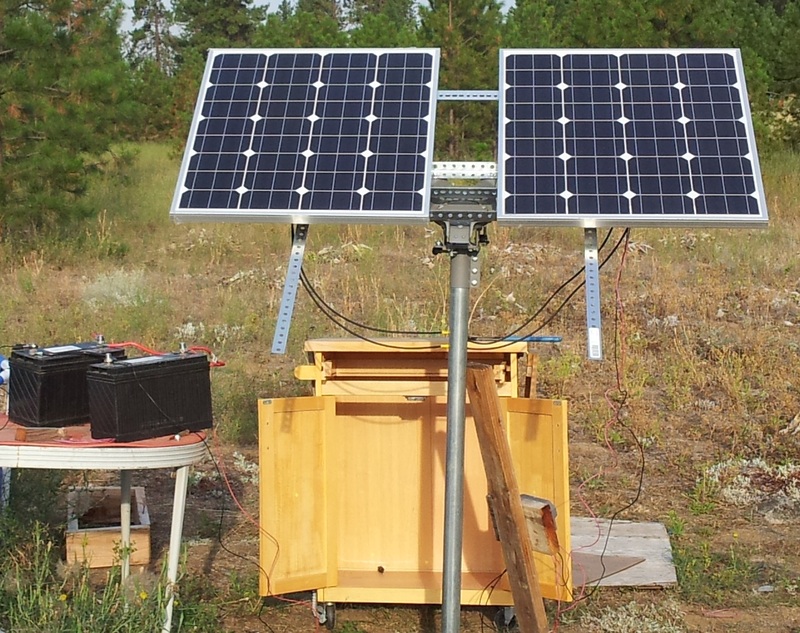 This entry was posted in Aquaponics and tagged aquaponics, batteries, charge controller, solar, solar panel by admin. Bookmark the permalink. where did you get your panels from? i want to run a pond aerator any suggestions on figuring up how much load it requires? You can figure out how many watts you need by multiplying voltage times the amps the motor will draw. Let’s say you figure you need 700 watts to run the motor. You’ll need more juice to start the motor (hopefully your battery bank covers this). 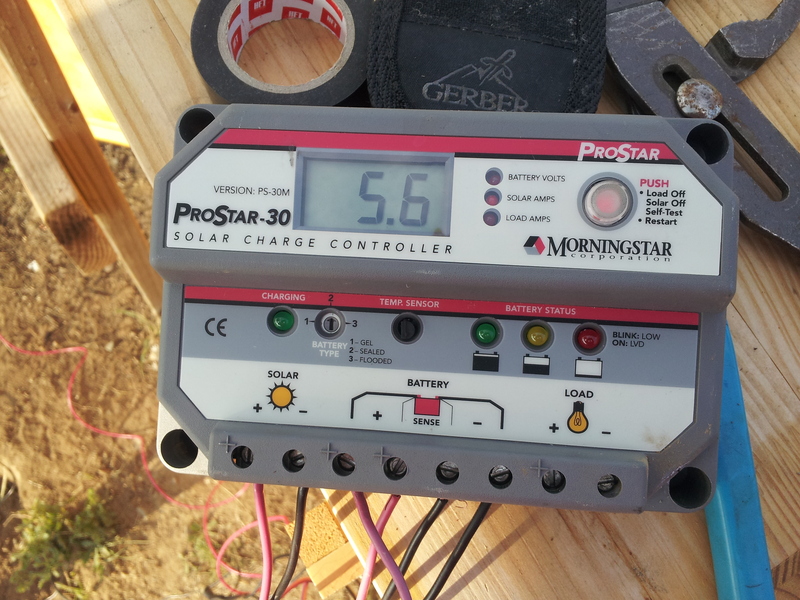 Your panels will seldom work at peak efficiency and your charge controller will steal some juice. DC electricity is really bad when it comes to distance, so your pump will need to be fairly close to your power source unless you go to AC. AC involves an inverter, more inefficiency. Don’t forget cloudy days. That’s all really depressing, I know. What are you trying to accomplish with the aeration? I’m assuming you need O2 for fish. Can you use bilge pumps as fountains? Shoot the water in the air and let it splash? You could also let them move the water from the bottom of the pond to the top. There are some efficient (and expensive) wind powered aerators also. I’m choosing to raise fish that require less oxygen (koi). I make sure that the return water from my beds falls a couple feet and hits the pond. Cooler water holds more air. Can you shade your water? Lots of variables.